I can’t believe another year is coming to an end already. It’s that time of the year when many people start thinking about Christmas presents. Before I had my daughter, I always left my Christmas shopping to the very last minute. Last week, even the last day or two was nothing unusual for me. But last year, it was our baby’s first Christmas. And I remember I was a bit clueless about what would be the best gifts for her. Apart from thinking about gifts, there are also traditions. Christmas goes hand in hand with traditions. Keeping some from your own childhood is a great way to introduce your baby to your family’s heritage. But as a new family, it’s also time to create new traditions and memories that will live through many Christmases you as a family will have. The little one was only six months old last Christmas, so buying too many toys seemed like a ridiculous idea to me. 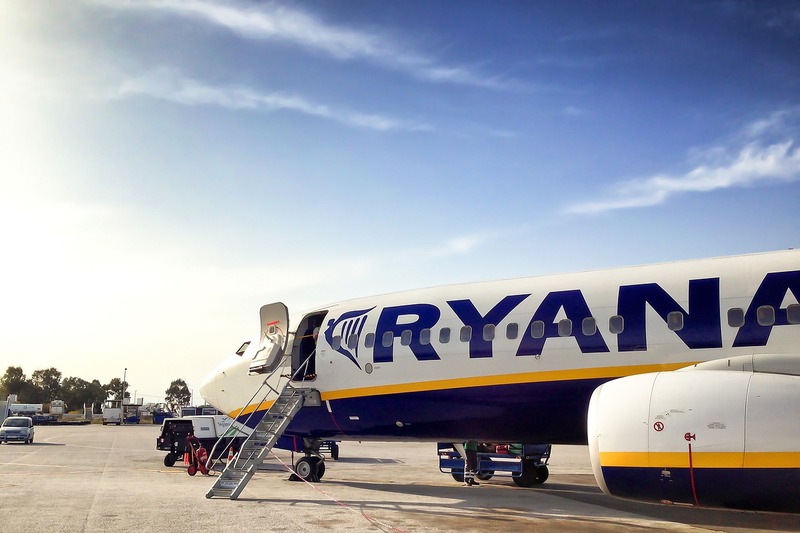 Plus, we spent her first Christmas in Slovakia with my family, so carrying toys onboard a plane wouldn’t be very practical either. So, instead of buying and carrying some bulky items, I wanted to get something memorable and useful. I’m totally in love with personalised gifts, so I decided to get something special and unique that can be cherished for many years to come. 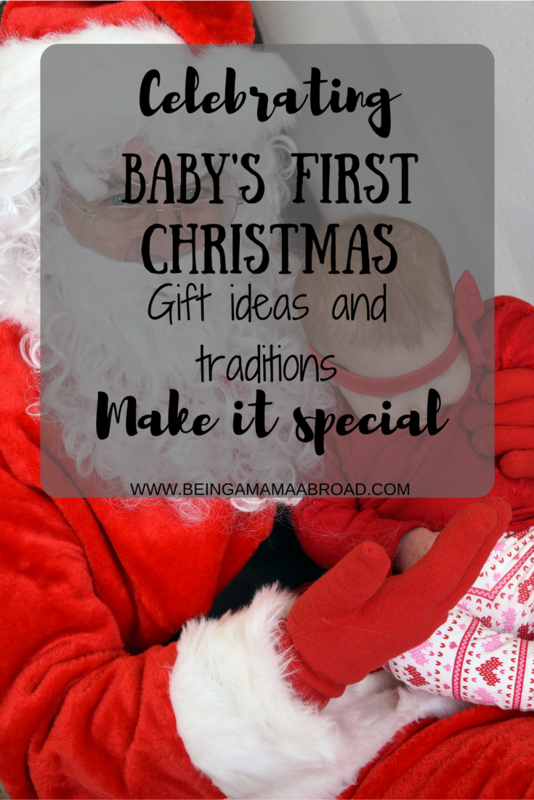 Stay tuned if you are looking for some gift ideas for your baby’s first Christmas and ways to start some new traditions with your brand new family. I got the same ornament for my baby and my little nephew. Both of them were born last year only five months apart, so I thought it would be lovely to get them some little ornament with their names on it and hang it on the Christmas tree. I’m planning on getting the ornaments every Christmas and watch as the collection grows on our Christmas tree with each passing year. Then one day our daughter can hang them on her own Christmas tree. She’ll have cute little keepsakes to cherish for years to come. Even better way is to make your own handcrafted ornaments to add even more of a personal touch. I’ll maybe try to make some this year if I feel brave enough. I want to make sure that our daughter understands the true meaning of Christmas. I want her to know that it’s not just about the presents, Christmas tree, time off school in the future, and lots of food. In our family, Christmas was always celebrated in a Catholic way. It’s a celebration of the birth of Jesus. I have to say since I came to the UK, I haven’t been celebrating Christmas the same way like at home. I used to work in the hospitality sector, which means I spent many Christmas Days at work. And Christmas just lost a bit of magic for me, because I wasn’t with my family. However, now that I’m a parent, I want to set an example for our daughter, and I’m really looking forward to celebrating Christmas with my own little family now. 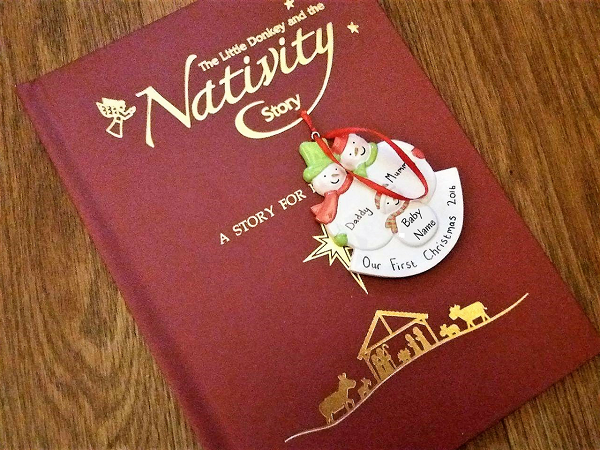 So, I got her a personalised nativity book, which illustrates the story of Christmas in a child-friendly way. We can read it together when she is a bit older. It’s a fun way of learning about Christmas. I love that her name is written throughout the entire book, not only on the cover. It really looks as if she was included in the story as well. Your baby definitely needs a Christmas outfit. Oh, and don’t forget the Santa hat, to complete the look. Just make sure it actually fits your baby’s head. The one we bought was too small for her. Luckily she got another one (perfect fit) from one of my friends. Those Christmas photos when they are all dressed up are just so adorable. Buying other baby clothing can be handy. We all know that during their first year, they grow way too fast. The good thing about buying clothes is that your baby can’t complain at this age. Enjoy it before she is old enough to start moaning every time she receives clothing instead of toys. But remember that she is likely to get some clothing from the rest of the family too. So don’t go overboard with it. Christmas is all about traditions. Every country, every single household has their own customs and heritage. We have lots of family traditions, and I would like to pass some of them onto our daughter as well. Let’s just mention few. Going to a midnight mass on Christmas Eve, opening presents after our dinner on Christmas Eve, decorating Christmas tree together usually on 23rd December, or watching traditional Christmas movies. I’m not saying that we will adopt all of these as a family. In fact, I quite like how British people decorate their homes and Christmas trees early. There is no doubt that we will create some new traditions as the time goes. So the mix of old and new should work well together. I remember how excited we were each year and it’s these traditions that created some of the best long-lasting memories. I want the same for our baby. To have loving memories when looking back at her childhood. Here is a fun idea that I would like to do every year. I want our daughter to have a photo taken with Santa. We have one from her first Christmas, although we didn’t even plan it. We wanted some professional photos when she was born, when she was six months old and a year old. How lucky we were that she was six months old in December and it just happened that Santa was in a photo studio on that same day we had our photo shoot. That’s when I got the idea of making it a tradition every year. 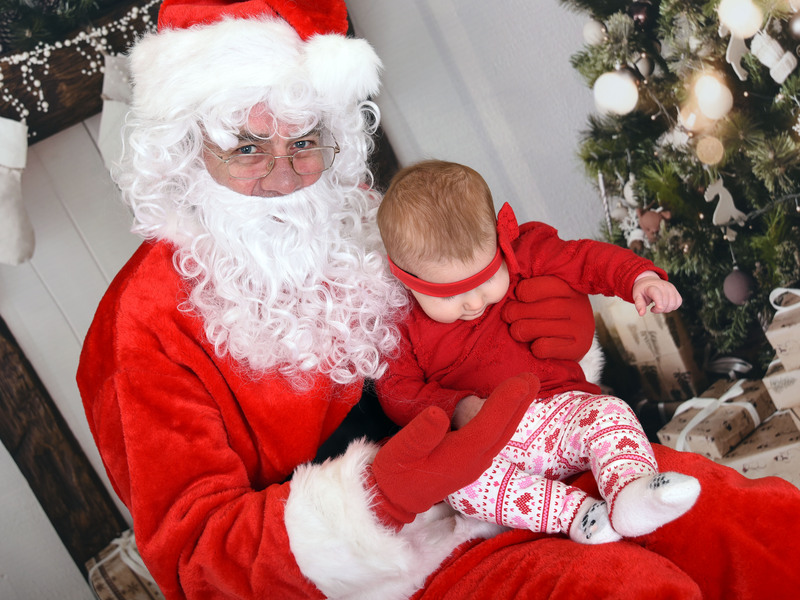 I was a bit worried that she would get scared and we will have one of those images with Santa and a hysterical baby next to him. Luckily it all went well. The little one wasn’t particularly excited about seeing Santa, as you can imagine. They really couldn’t care less at this age. But she was quite happy playing with his white beard. Having grandparents in two different countries means there is only a limited time our baby will get to spend with them. Of course, they miss having her around more often, so I thought I would get them something that might put a smile on their faces every time they look at it. A personalised baby photo calendar seemed like the perfect choice. And to say they were delighted when they saw twelve cute photos of the little one printed on a calendar is an understatement. They have a different image of her to see and rejoice in every month. Plus, we printed some more images that we took during her first months. Some for us, some for grandparents. I know what you are thinking. Who on earth print images these days when everything is easily accessible in digital format? It may seem old-fashioned to many people, but when you live away from all your family, that’s one way of staying connected. So, that’s just another tradition I want to keep. Every year on Christmas, both grandparents will receive a parcel with a personalised photo calendar plus some more photos capturing her year. You just can’t go wrong with that. You see, there is a lot to think about. Baby’s first Christmas is a special time. Start creating those traditions that you can follow every year. 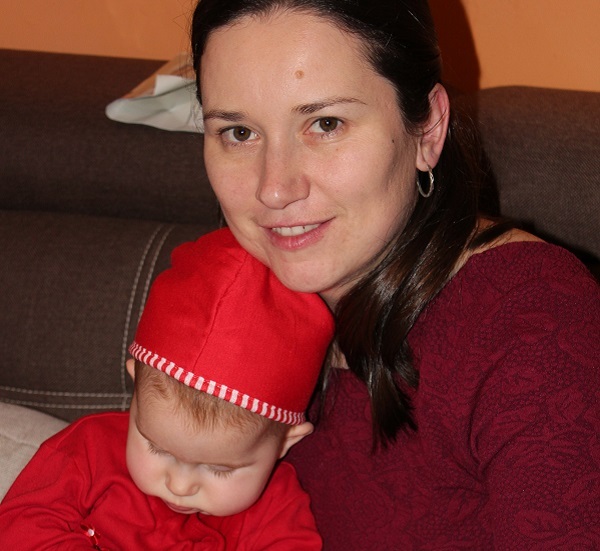 Do you have a favourite tradition or gift you gave your baby on his/her first Christmas? Please share it with us. My parents gave my sister and I ornaments every year as well! My mom always said that they wanted us to have a collection of our own when we moved out someday and it’s so much fun to look at them every year and think about the different hobbies and moments in our lives that they represent. I have been continuing the tradition with my daughter now as well! Of course I love the idea of a personalized Christmas book as well. I am actually working on a post about personalized children’s books right now! I try to give my daughter at least one new holiday book every year. That’s exactly my aim with the ornaments. For my daughter to have these fond memories when looking back at her childhood. Personalised books are brilliant. I bet your daughter loves them too. I’ll be checking your new post on the books for some inspiration. I love the personalized options for babies. We have so many toys and clothes already, so the photo gifts and first Christmas outfit ideas are great! shopping for a baby is never easy but setting traditions is so special! I agree completely, traditions create memories. Oh I love these ideas! I have always been an experience over items giver I love it when family and friends give special sentimental things or experiences to my son. They are worth so much more than the things that end up in the corner and forgotten. Yes, experience is always a winner over anything material people don’t really need or want. These are great ideas! I love a personalized Christmas! Me too. A personal touch makes it extra special and magical. Great ideas! First Christmas’ are always sooo much fun for parents! I can vividly remember both of my little ones first Christmases! I love that ornament, you can even get a new one each year and start a tradition! I love your ideas and am totally with you on things being useful. Your choices were so cute, i love the ornament! We loved doing a special ornament for my babies first Christmas. Brilliant, I’d love to do some handmade as well. I loved the firsts with my kids. Birthdays, holidays, its such a great time to make some memories and take great photos they can look back on when older. Yes, every first in child’s life is special. They grow up way too fast.